Crayons. We all have memories of new boxes of Crayola crayons all perfectly sharpened and lined up in their new orange and green box with the flip-top lid. Crayons are great for little kids, but what most people don’t know is that they are great for real artists too. Yep, real artists use crayons. Of course they don’t use Crayola. Though they are the standard for coloring books and doodling, and come in a mind-boggling array of colors, Crayola crayons could be higher in quality when it comes to color intensity and texture. In other words, for professionals, they are too hard and their colors are too weak (unless you are trying to remove them from your couch fabric). What do “Real Artists” Use? Real artists use professional crayons. 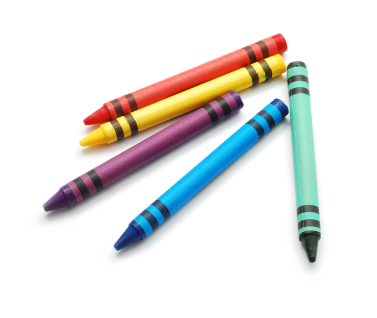 The top of the line is a product made by the Caran d’Ache company called Caran d’Ache Neocolor II crayons. They are soft and smooth, and lay down intense thick color that can be blended with other colors or with water. Crayola can’t compete with Caran d’Ache in any way. Except in price. Caran d’Ache, like most “top of the line” art mediums, carries a “top of the line” price. A tin of 10 crayons costs around twenty dollars. And who wants only 10 crayons to choose from? A tin of thirty colors provides a better selection. The cost? Their list price is about seventy dollars. Most parents (and art teachers) cannot afford to purchase this kind of quality for their students. Fortunately there is an affordable option. The Reeves company makes a professional-type crayon that is superb. 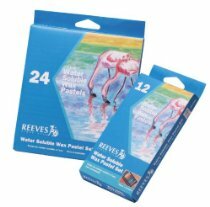 They call their product wax pastels, and they come in packages of 12, 24 and 48. Their prices range from about five to twelve dollars. They are soft in texture and intense in color and they blend easily. They can also be worked with water and a brush. These are the crayons that I get for the students in my classes. Again, for younger students (up through about 2nd grade), Crayola crayons are fantastic. But older students don’t want to use Crayola; it makes them feel like children. They want to feel like “real artists.” And if you can’t afford the “real artist” price of Caran d’Ache crayons, Reeves is a great substitute. Great information on the use of crayons by professional artists! Please don’t be too quick however, to discount the use of Crayolas professionally. Currently, I’ve only been working in crayons for a year, but I love the variety and vibrancy a simple set of Crayolas can provide an artist when starting out with the medium. This will soon be changing as I look to expand my use of the tool, but I have literally fallen in love with the medium and patrons of my work have followed suit. I invite yourself and everyone to view my work thus far, using only Crayolas and see for yourself. Right now, I can only imagine what the difference of the upgrade to the professional tools will be, but I can assure you, it won’t be long. Thank you for your resource on the crayon! It is a well-known, yet highly underrated medium, for sure.